The new edition of The Holy Machine is now available. It’s the same book inside the cover, of course, but books are objects too, and this new version seems to me a pretty desirable thing. “A triumph.” – Paul di Filippo, Asimov’s SF. “…the sparse prose and acute social commentary of a latter-day Orwell…” – Eric Brown, The Guardian. “The most amazing book I have ever read…. Simply amazing. A must read for all human beings!” – Rafael from Brooklyn: enthusiastic Amazon.com reviewer! 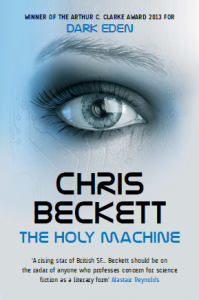 The Holy Machine is also available as an unabridged AUDIO BOOK, read by John Banks. More about The Holy Machine here.